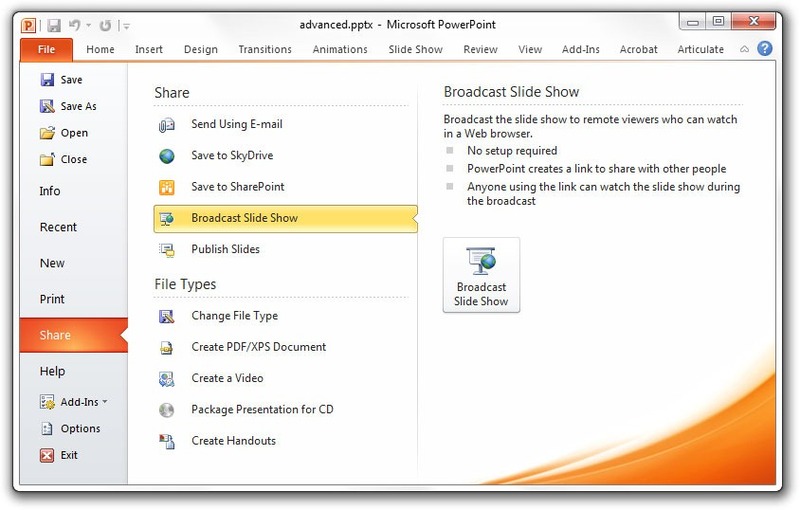 You can use the "Broadcast Slide Show" command in PowerPoint 2010 to deliver live presentations to your remote audience over the Internet. To get started, open the Presentation and choose "Start Broadcast" from the Slideshow tab. Select "Microsoft PowerPoint Live" as the broadcast service, sign-in using you Windows Live ID and send an email invitation to your co-workers containing a public link to your online presentation. Now play the presentation on your local computer in full screen mode and as you change slides locally, the same will happen on the screens of your remote audience. To view a PowerPoint broadcast, all you need is a browser like Internet Explorer, Firefox, or Safari for Mac. If you are using an older version of PowerPoint, you can upload your presentation slides to services like Google Docs or Zoho Show and deliver presentations through the browser. PowerPoint 2010 saves you from the hassle of uploading slides onto another service.